The Zoho CRM integration allows you to create a new Zoho CRM lead from a Blitzen form entry. Note, to use this integration you first need to have a Zoho CRM account. Navigate to the ‘Integrations’ section in the left-side panel and click on the ‘Zoho CRM’ app. If, for any reason, you would like to disable this app, just move the slider to ‘Off’ or disconnect it all together (How to Disconnect an Application). Choose a form or survey to work from (How to Choose an Input). The only type of form you can use the Zoho CRM App with is one that contains the ‘Name’ field, but we recommend asking for at least one more piece of contact information (like an email) to strengthen your CRM. Drag the Zoho CRM App over into your workflow. You can configure the app by clicking the ‘+’ icon. The default setting is to sync all submissions from the input form or survey. If the default is what you wish to do skip the 'Filters' section. If you want to segment submissions, simply add filters. Click ‘Add custom filter’ and use the three fields to create a segment. In this sections you will be able to map the fields from your form to fit Zoho CRM categories. Use the drop-downs to fill in as much information as you can. 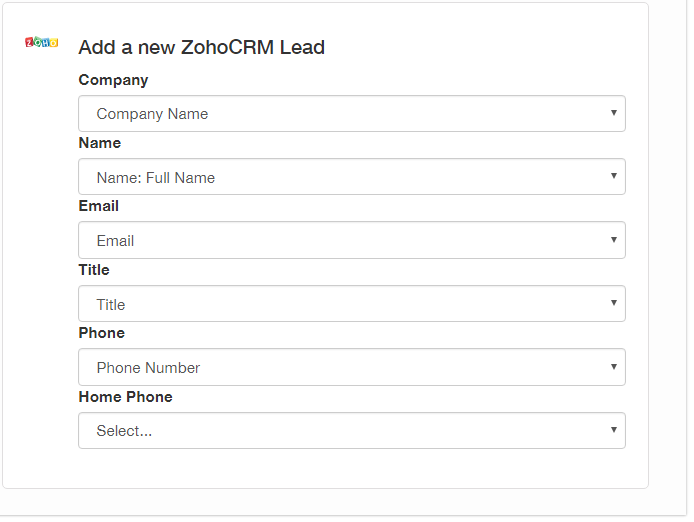 The changes will auto save and now every time someone fills in your form a lead will be auto generated in your Zoho CRM.